Opportunity. For any team to be successful over a course of a season, they must capitalize on opportunities. The Harvard Crimson followed a theme of missing opportunities this season. Whether it was allowing teams to comeback from 2-0 deficits, or not finishing sets after gaining a big lead, Harvard found it difficult to reach its potential with a young but fiery team. 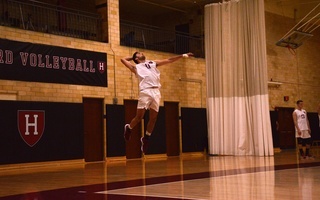 Harvard (10-13, 7-7 EIVA) had the opportunity in its last regular season road trip to punch a ticket to the EIVA tournament by defeating both the Princeton Tigers (12-13, 8-6 EIVA) and NJIT Highlanders (13-13, 6-8 EIVA). 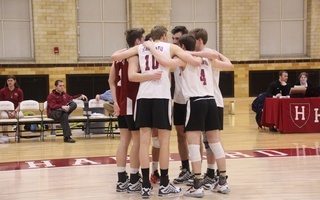 Unfortunately for the Crimson, after a loss to Princeton in three straight sets on Friday night, and Sacred Heart beating the Tigers the day after, its season was brought to an early and abrupt close. The Crimson found itself in a difficult position Saturday afternoon. After losing to Princeton it needed a victory to stay in the hunt for a spot in the playoffs. Harvard did not want its destiny to rely on the performances of other teams and came out with a new found drive after a devastating loss to the Tigers. 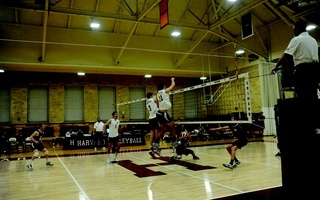 After a nail biting 26-24 victory in the first set, Harvard came out in the second set hot and the momentum carried them throughout the match. Harvard’s offense and defense were top notch in the second set boasting a hitting percentage of .412, and limiting the Highlanders to a hit percentage of .080. After the dominating second game the Crimson would close out the match 25-21 in the final set. Freshman Erik Johnsson lead the effort with 14 kills, while co-captain Casey White had seven. Freshman Matthew Ctvrtlik had 14 assists and junior Marko Kostich had eight. The Crimson, dropped two crucial home games the previous weekend and had to win its next two conference games. The first win had to come through Princeton, NJ. However, the Tigers had no interests to do any favors for its Ivy League rival. 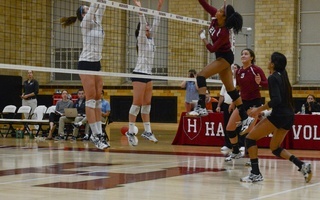 Despite holding 1-0 and 2-1 leads, Harvard needed a fifth set to beat the Pioneers and secure a first-round matchup with George Mason on Wednesday.